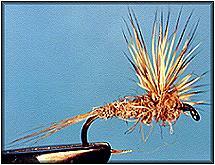 Fly Angler's OnLine "Beginning Fly Tying Part 29"
The Comparadun is a classic spring creek pattern. 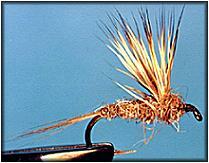 It's not only a great mayfly emerger pattern, it also does double duty as a spent wing spinner pattern. The fan shaped wing is visible under even the poorest lighting, the bottoms of the wing are buoyant enough to float the fly, and the shape of the wing guarantees an upright float. I'm not sure who designed the Comparadun, but I can tell you Craig Mathews, the owner of Blue Ribbon Flies in West Yellowstone Montana, designed the Sparkle Dun; our second fly this week. A lot of western anglers owe their most successful fishing days to some of Craig's patterns. As you look at the two flies we'll be tying this week, you'll likely notice they are very similar. In fact, the Sparkle Dun is nothing more than a modification of the Comparadun. The only real difference is the Sparkle Dun has a Z-Lon or antron tail instead of the traditional split tail on the comparadun. Some of you have probably already noticed that there's a lot of similarity between a lot of patterns you can find in fly pattern books. That's because local tyers, much like you and me, adjust, modify and localize certain patterns to meet specific needs. It's a common thing that happens all the time. That's how new patterns are developed, and how this sport continues to evolve. I'm all for adjusting, improvising, modifying and improving existing fly patterns. If you've gained nothing else from this series, I hope you've gained personalization of the flies you've learned to tie. I'm showing you methods and techniques through the medium of selected fly patterns, but I also stress that each and every fly you tie is yours, so you have the liberty to tie it the way you want to suit your needs. Hopefully, as you learn these techniques, you're trying those techniques on other patterns that use the same techniques. In that way, you'll be able to pick up any pattern book and use the techniques you've learned here to tie any selection in that book. Of course, there are a few techniques you haven't learned yet, but then again, this series isn't over yet. However, each week you get a little closer to the accomplished tyer you want to be. This week, we'll learn another technique: fan shaped wings. Once you've learned to tie these wings with deer hair, you'll have the skills to tie them with CDC, snowshoe hare's foot hair, synthetic fibers like antron, or any other material that lends itself to the task. Are you ready for a new challenge? Great! Let's learn something new. Thread: 6/0 Gudebrod or equivalent, black or color to match body. 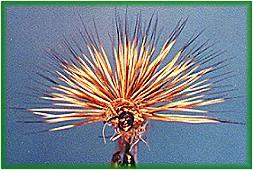 Tail: Hair or hackle fibers, tied split. Body: Anglers Choice Llama dubbing. 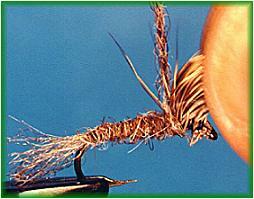 Any quality dry fly dubbing will also work. 1. 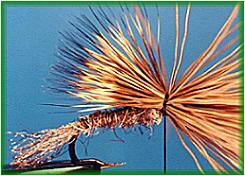 Tie a split tail of your choice using hair, synthetic hairs (micro-fibets) or hackle fibers. 2. Clip a bunch of deer hair, remove the fuzz, even the tips in a hair stacker, and measure it for length to create a wing. 3. While holding the hair in place above the tie in point, make a single loose wrap of thread around the hair. This loose wrap will help prevent the hair from spinning around the hook. 4. Finish taking the thread around the hook and draw the hair down to the hook with gentle, downward pressure on the thread. 5. Make another wrap of thread around the hook and hair, increasing the pressure on the thread. This will cause the hair to flare. Make a third wrap of thread and cinch the thread tight, but not tight enough to break the thread. The hair should now be fully flared, but should remain on top of the hook. 6. Grasp the wing with your fingers and pull it back. Make about a dozen wraps of thread in front of the base of the wing to hold it upright. 7. Once the wing is firmly in place, trim the butts of the hair and wrap the short ends down with thread. 8. Dub a body snug against the backside of the wing. 9. Pull the wing back and continue dubbing snug against the front of the wing. The wing should now be squeezed between the dubbing on the back and front sides. 10. Tie the thread off and whip finish, but don't cement just yet. 11. Pull the hair wing downward on both sides of the fly, evening it by hand until it is level on both sides of the fly with the bottom of the body. Try to get the hair thickness even all the way around the fan wing. Once you're satisfied with the wing's shape and thickness, apply a few drops of head cement to the thread wraps behind the hook eye, and to the base of the wing. Try to apply the cement evenly over the entire wing base so it will stand up to repeated casting without losing its shape. 12. Your completed fly should look like this from the front. Notice how coarse the mule deer hair is? This wing will be more fragile than a wing created with fine hair. As you look at this next fly, you're going to say it's almost the same as the first one. That's correct, except for one small but significant change; the tail is different. To the human observer this might not be significant, but to the trout it can make a big difference. In fact, it might be the difference between catching fish and going home fish-less. When aquatic insects emerge from their nymphal or pupal shells, they have their old skin attached for a short time as they dry their wings and finalize their emergence. While it's attached to the emerging adult, this skin is referred to as a trailing shuck. By the time the insect is ready to fly, the shuck has been shed and has drifted away. From below, the attached shuck is semi-transparent and sparkles in the sun. It's often the catalyst that triggers a strike from fish looking for a meal that won't be able to escape. That's why the Sparkle Dun is significant. 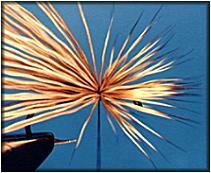 The antron or Z-Lon tail looks like a trailing shuck. When emerging mayflies are on the water, that tail will often trigger a strike from fish that would shy away from a comparadun. To show the difference the hair you choose can make in the finished fly, I've tied the next fly with a finer, darker deer hair. For the record, using fine deer hair results in a better looking and stronger wing. 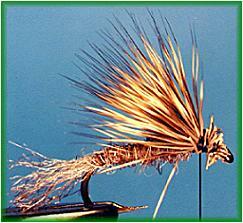 But, if all you have is coarse hair, as you can see, it's possible to tie a nice fly with that hair too. Although good materials are important to the creation of durable and well-balanced flies, never let something like less than ideal materials stop you from tying a fly you want. I've also shown the other prominent method of tying the wing. There have been, and will be many discussions about which method of wing attachment is best. One group says the wing should be attached with the tips of the hair pointed back so the wing will look more natural if the dubbing that supports it begins to relax during fishing. The other group feels it's a stronger wing if it's attached the way I showed you in the Comparadun. I personally don't think it matters. The important thing is that the wing is of the proper proportions and is attached securely. I'll let you decide which method suits you best. 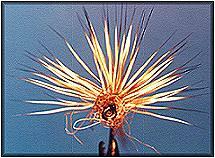 Hook: Light wire dry fly. Mustad 80000BR or equivalent. Size 12 to 22. 1. 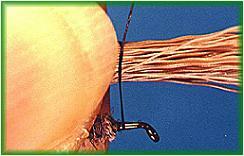 Tie a tail of Z-Lon or antron fibers as shown. 2. Dub a body to the wing attachment point. 3. Clip a bunch of deer hair, remove the fuzz, even the tips in a hair stacker, and measure it for length to create a wing. 4.While holding the hair in place above the tie in point, tips pointed to the back, make a single loose wrap of thread around the hair. This loose wrap will help prevent the hair from spinning around the hook. 5. Finish taking the thread around the hook and draw the hair down to the hook with gentle, downward pressure on the thread. 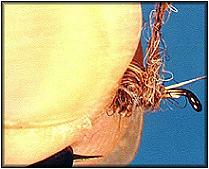 Make another wrap of thread around the hook and hair, increasing the pressure on the thread. This will cause the hair to flare. Make a third wrap of thread and cinch the thread tight, but not tight enough to break the thread. The hair should now be fully flared, but should remain on top of the hook. 6. Clip the hair extending over the hook eye close to the hook. Wrap the remaining hair ends down with thread. 7. Pull the wing forward and dub tight behind it. Then finish covering the hair ends in front of the wing with dubbing. 8. Whip finish, trim the thread, spread the wing to a full fan position and cement the wing base and head. 9. From the front your finished fly should look like this. Notice the difference the fine hair makes? If you practice these techniques, you'll be able to tie these flies that have frustrated other tyers for years. The secret to this type of wing is in that first wrap of thread around the hair. It keeps the wing from spinning around the hook. Practice that one technique well, you'll see it again when you begin tying bass flies. 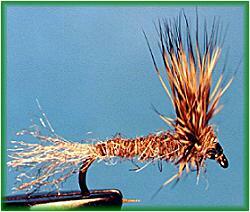 It also helps if you've been having problems with caddis wings and other hair wings.